The "Dutch Lady Series"™ of Hydrangea Pride of Place Plants Inc.
Hydrangeas, Grandma's plant ? Not this group. Bred specific for purpose by Mr.Daan van der Spek in Holland, for the cut flower and greenhouse trade market. The whole series will make ideal container plants. Flowers at a early age and lots of them. With my mission to get New good Garden plants into the trade, I need to suggest that this collection is catching on very well in Europe and the Breeder has some very good selections currently under development. 8 more cultivars have been added to the existing 8 cultivars from the series, which are now currently out at the trial Nurseries. They are different than the predecessors. Flower type, they can be used as a cut flower, and as a container plant,were the emphasis on this Breeders list of criteria. 00-1-42: A hydrangea, which is white, combined with pink. It has a toothed margin and rosettes. This variety is a carnation type. 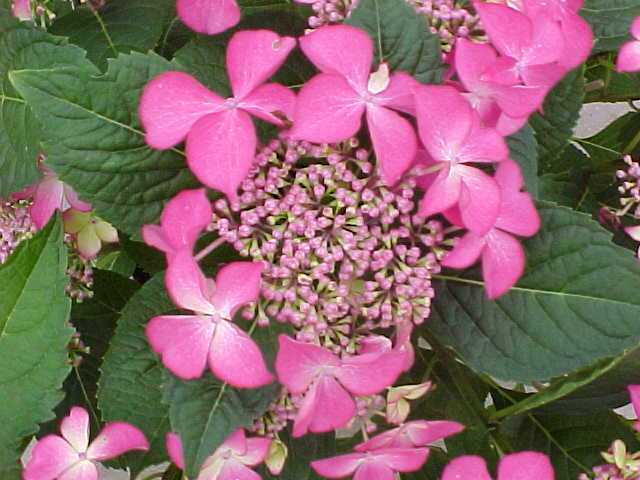 The pink is light pink and this variety can be used as and outdoor plant an as a cut flower. This variety has strong stems. 00-3-16: A hydrangea, which is dark pink, combined with white flower edges. It has a toothed margin and rosettes. This variety is also a carnation type and suitable as outdoor plant and as a cut flower. This variety has very strong roots. 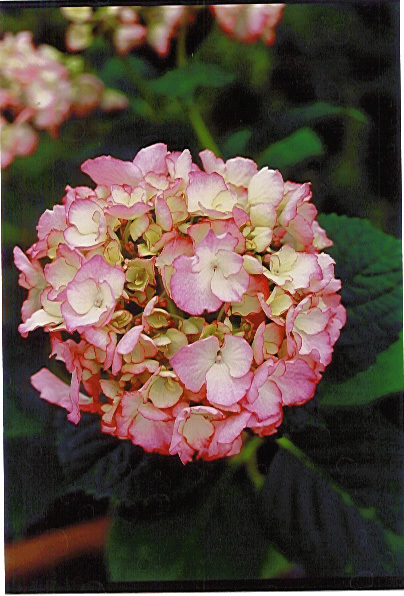 02-8-4: A hydrangea, which has not much white in it and colors to sprinkling pink. The flower is pointed and the leave is young and red. This variety is in the line of Hydrangea Sabrina (of The Dutch Ladies Series). 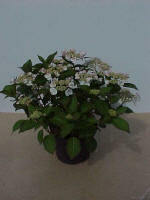 This variety is suitable as pot plant and outdoor plant. 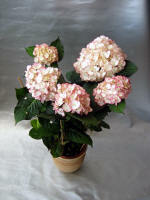 99-1-50: A hydrangea, which has not much white and has beautiful dark pink flowers. It is the sister of Hydrangea Selma. It is suitable as pot plant, outdoor plant and cut flower. This variety is bigger than Selma and a bit lighter pink. 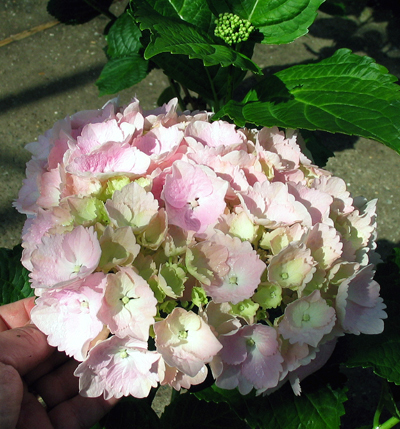 Samantha: A hydrangea, with a green flower, which will become light pink. The flower is pointed. 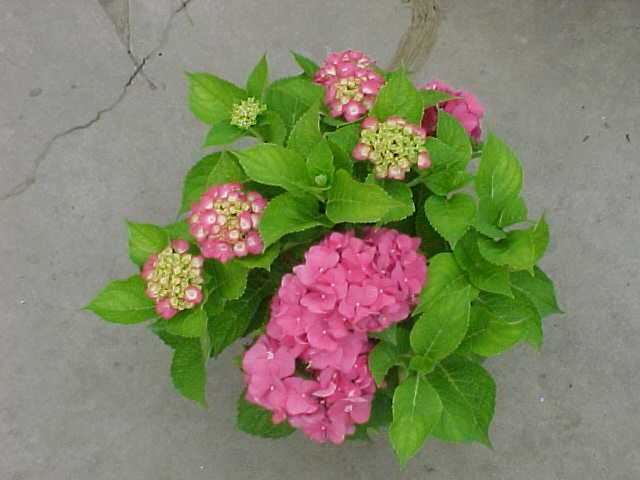 This variety is a cut flower, but it is also suitable as pot plant and outdoor plant. 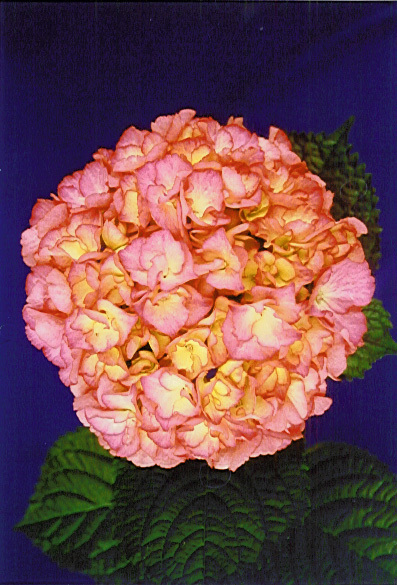 00-1-46: A hydrangea, which is better than 00-1-42, but has a harder color pink. It has a toothed margin and rosettes. It is a carnation type and suitable as cut flower and outdoor plant. 99-3-16 / Shakira: A hydrangea with a white flower. It has a light-toothed margin. This variety is suitable as cut flower, but a small cut flower. This variety grows good and is a strong variety. It is a good pot plant. 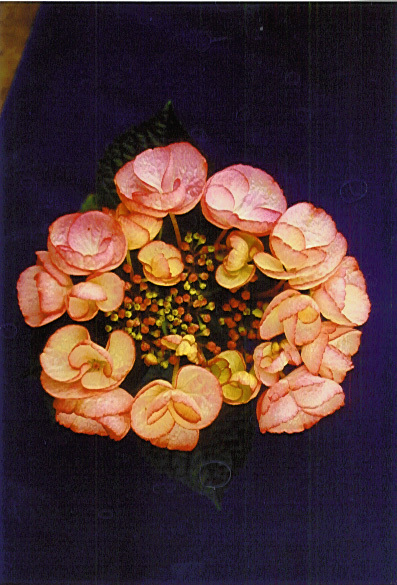 00-1-70: A hydrangea, which is like the 00-3-16. It is a carnation type, has white flowers and it has a toothed margin. It also has rosettes. The variety is suitable as cut flower and outdoor plant. This variety is also bigger and has stronger stems than Shakira.